On 1 March 2017, the European Commission presented a White Paper on the future of Europe. A series of reflection papers covering key topics for the future of the European Union with 27 Member States have been published subsequently. The reflection paper on the future of the European Defence is the fourth in this series. It outlines the main trends and challenges that will shape the future of our security and defence and on this basis, sets out options in three different scenarios for moving towards a Security and Defence Union. While not mutually exclusive, these scenarios are underpinned by different levels of ambition for the EU in doing things together in security and defence. The European Union has brought an unprecedented period of peace to our continent. However, the rising instability in Europe's neighbourhood as well as globally and new emerging security threats stemming from economic, environmental and technological drivers present important challenges for our security. Citizens feel increasingly concerned about security and look to the Union for protection. If we want to deliver on their expectations, security and defence must play a more prominent role in the future of the European project. This was acknowledged in the Rome Declaration which set out a vision of a safe and secure Union committed to strengthening its common security and defence. First ambitious steps towards a Security and Defence Union have been made. The Reflection paper complements the ongoing work on the defence package endorsed by the European Council in December 2016, consisting of the implementation of the EU Global Strategy in the areas of security and defence, the European Defence Action Plan and our cooperation with NATO. These three building blocks are currently being translated into very concrete actions: we are reforming our Common Security and Defence Policy structures, developing civilian and military capabilities and instruments, deepening European defence cooperation and enhancing our partnerships with partner countries and partner organisations such as the UN and NATO. This being said, more needs to be done if the Union is to take greater responsibility for European security. Building on the progress, it is time to consider the concrete ambitions with respect to the future role of the Union in security and defence. This reflection paper is the contribution of the European Commission to this debate which will continue across the 27 Member States. The stakes for Europe and our citizens are very high. It is our responsibility to deliver on the peace promise for the benefit of this and future generations. […] a Union ready to take more responsibilities and to assist in creating a more competitive and integrated defence industry; a Union committed to strengthening its common security and defence, also in cooperation and complementarity with the North Atlantic Treaty Organisation, taking into account national circumstances and legal commitments […]." "I also believe that we need to work on a stronger Europe when it comes to security and defence matters. Yes, Europe is chiefly a ‘soft power’. But even the strongest soft powers cannot make do in the long run without at least some integrated defence capacities." Rising from the ashes of two World Wars that took 80 million lives, our Union was inspired by a vision of lasting peace on the European continent. More than sixty years on, most Europeans have enjoyed a peace spanning three generations and seven decades, the longest period in Europe’s troubled history (see Figure 1). While the world we live in may have changed profoundly in that time, our commitment to peace remains unshakeable. Today we enjoy unprecedented opportunities in our everyday lives, but we are also faced with new threats and challenges. Peace and security at home can no longer be taken for granted in a world in which global and regional powers re-arm, terrorists strike at the heart of cities in Europe and around the world and cyber-attacks escalate. Faced with this context, the European Union and its Member States have a duty and responsibility to protect citizens and promote European interests and values. Security has become one of the biggest concerns for Europeans. They look to their Union for protection. They demand, deserve and must be able to feel safe and secure in Europe. Protecting our societies and freedoms is a joint responsibility. If we are to deliver on our peace promise to the next generations in the same way as was done for us, security and defence must play a more prominent role in the European project. Our Union is best placed to provide unique added-value when it comes to the future of European security and defence. Many of the threats we face today do not respect national borders. While Member States remain on the front line and are responsible for deploying security and armed forces when needed, these new types of threats are best prevented and tackled by working together. That cooperation can be triggered, facilitated and reinforced by the EU and help make collective action more effective. The Union can provide the framework and the incentives for EU countries to develop and maintain more and better defence capabilities. This can be done through more systematic cooperation and the joint development of technologies and capabilities needed to keep Europe safe. One of the major strengths of the EU's approach is its blend of soft and hard power. It uses security and defence instruments alongside diplomacy, sanctions, development cooperation and trade aimed at preventing conflict. It promotes peace, inclusive growth, human rights, rule of law, and environmental protection at home and abroad. While soft power alone may not be enough in an unstable world, this integrated approach lies at the heart of sustainable security. Our Union also provides a unique platform to coordinate security and defence policies with core partners such as the North Atlantic Treaty Organisation and the United Nations. An unprecedented momentum is currently drawing the EU and NATO closer together. In his 2016 State of the Union address, President Juncker called for a "Europe that protects and defends, at home and abroad". This reflection paper considers the issues that matter for the future of our security and defence. It does so by looking beyond current debates and decisions. Instead, it considers underlying structural trends, presents different scenarios of possible futures for European security and defence by 2025, and maps our possible ways forward. A number of strategic, political, economic and technological trends suggest the time is ripe for a European step change in the security and defence field. After decades of peace in Europe, new realities are emerging within and beyond our borders. To our east, countries are facing military, economic, political and energy-security related threats and vulnerabilities. Across the Mediterranean and parts of sub-Saharan Africa, the spread of ungoverned spaces and conflict has left a vacuum for terrorists and criminals to thrive. Regional rivalries are escalating and we have witnessed a dramatic rise in civilian victims and refugees across the world, with more than 60 million people displaced. Greater connectivity is blurring the boundaries between internal and external security. And climate change and resource scarcity, coupled with demographic growth and state fragility can also drive conflict and instability around the world. At the same time, the Transatlantic relationship is evolving. The onus of improving European security lies first of all in European hands. The resources should be there: collectively European countries are the second largest military spender worldwide. Together with the United States and others, Europe has a responsibility for global peace and security. While acting together with our partners will remain the EU's norm and preference, we should be able to act alone when necessary. In 2016, national governments stepped up their response to pressing security threats and the concerns of their citizens. Defence budgets were increased accordingly. But the road ahead is still long. Moving towards Europe’s strategic autonomy requires spending more on our defences, as well as spending better and spending together (see Figure 2). The United States already invests more than twice as much on defence than all Member States combined and will increase its budget by almost 10% in 2018. China has increased its budget by 150% over the past decade, with a further rise of 7% expected in 2017, while Russia invested 5.4% of its GDP on defence last year. EU leaders have committed to strengthening European security and defence. And that is what citizens ask and expect of them. 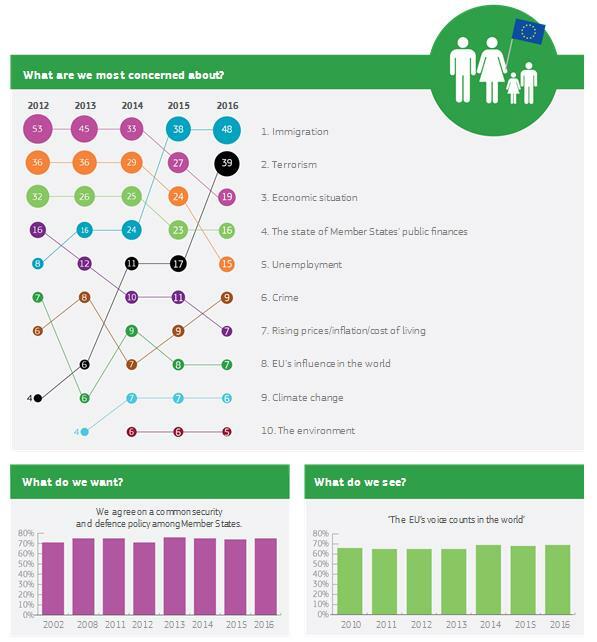 Opinion polls clearly show security has become the number one concern for most European citizens (see Figure 3), even if the reasons of insecurity differs across Member States. Europeans also agree that collective action between EU countries is indispensable for their security. Large majorities in all Member States would like to see “more Europe” in security and defence (Figure 3). In a space where goods, services, money and people move freely, security can neither be compartmentalised nor entirely guaranteed by Member States acting alone. The message from Europeans is crystal clear: security and defence should be an integral part of what our Union does. Today, defence markets are highly fragmented, creating a lack of interoperability and at least €30 billion worth of opportunity cost. Compared to what is spent, the defence capabilities produced lag woefully behind (see Figure 4) and there are differences in Member States' contributions to European defence. In a connected, contested and complex world, Member States are simply too small to deliver on their own. Continental-sized powers are far better equipped than small-to-medium sized States. Economies of scale matter more than ever to improve effectiveness and efficiency. This is doubly important as pressure on national budgets remains high. The tension between fiscal constraints and competing public policy priorities will continue to characterise the political economy of many Member States. At the same time, competition among global industrial players will rise, calling for a more efficient use of resources (circular economy). If Europe is to compete worldwide, it will need to pool and integrate its best industrial and technological capabilities. Technological change is also dramatically transforming the nature and face of security and defence. Big data, cloud technology, as well as unmanned vehicles and artificial intelligence are revolutionising the defence sector. They are also increasing the technological edge of the civilian sector in the field of defence. However, having such relatively accessible technology also enables the rapid rise of non-conventional, transnational and asymmetric threats, such as hybrid, terrorist, cyber, chemical, biological and radiological attacks. The surge in Internet users has made cybercrime and terrorist use of the web a new frontier of 21st century warfare. Moving forward, effective European security and defence will rest on efficient coordination of major research and development investments made by the EU and its Member States. This will help keep pace with new trends and generate the technological and industrial capabilities Europe needs to ensure its strategic autonomy. Security threats are not far from our borders and citizens. Political leaders have already started responding to such trends. A set of initiatives are underway to implement the Global Strategy in the field of security and defence, to develop stronger relations between the EU and NATO and to enable Member States to engage in defence research and develop defence capabilities together. First, having stronger and more sovereign Member States in a globalised world requires having more cooperation within the European Union, including on defence. This will fully respect each country's constitutional rights and responsibilities. In fact, systematic defence cooperation and gradual integration will contribute to the preservation of their national sovereignty. Second, there have historically been differences in threat perceptions and strategic cultures. The nature of threats has also changed over time. We now face hybrid and transnational threats, as well as the significant impact of conflicts in surrounding regions. A Security and Defence Union should encourage a stronger alignment of strategic cultures, as well as a common understanding of threats and appropriate responses. It will require joint decision-making and action, as well as greater financial solidarity at European level. Third, the nature of the Transatlantic relationship is evolving. More than ever, Europeans need to take greater responsibility for their own security. As is currently the case, the EU and NATO would continue to coordinate their actions on both hard and soft security. 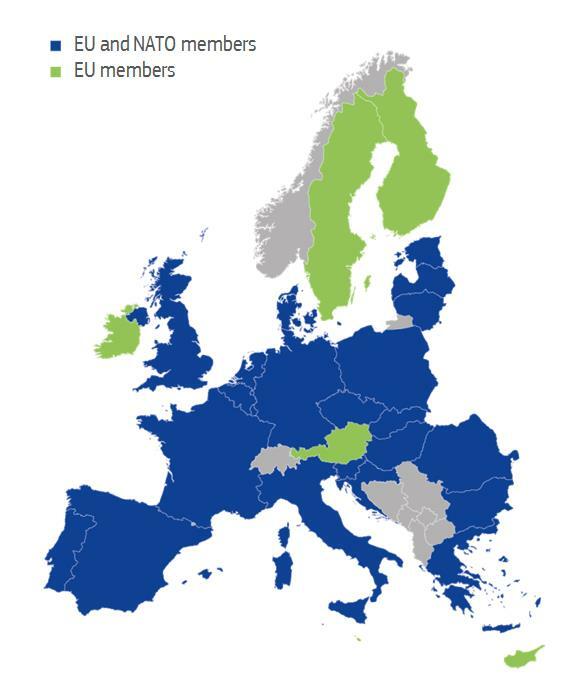 In parallel, the EU would provide the framework within which the 27 Member States after Brexit – 21 of which are NATO Allies (see Figure 5) – would collectively strengthen their defence and address existing shortfalls. This would allow the EU27 to take charge of their own security to a greater extent and make a real leap forward in contributing to international peace and security. Fourth, we need to increase the scope and efficiency of defence spending. Duplications between Member States can affect the interoperability of their defence equipment. It can also lead to a lack of preparation and readiness of armed forces and gaps in defence capabilities. To address this, Member States’ defence spending should be better coordinated. The bulk of financial resources for defence will continue to come from national sources. However, an EU budget reflecting a new ambition in defence, coupled with a large-scale European Defence Fund, should enable Europeans to spend better and improve value for money. The European Council might consider how the current limitations to the common financing of EU military aspects can be overcome when progressing towards a common defence. Finally, systematic defence cooperation and integration in turn requires a true Single Market for defence. This means encouraging industrial competition, cross-border access of smaller industries in the supply chain, specialisation, economies of scale for suppliers, optimised production capacity, lower production costs and security of supply. A Single Market for defence would also facilitate critical research and the emergence of start-ups to develop the key technologies Europe needs to address its security challenges. But there will also be transition costs and legitimate concerns to address through appropriate measures and ensuring the protection of national security interests. Depending on the political will of Member States to make progress on these issues, three scenarios can be envisaged as we look forward to 2025. The scenarios are all incremental steps in the same direction. They all take into account the different trends and strategic drivers listed above. The building blocks in the different scenarios are neither exhaustive nor mutually exclusive. They rather highlight different elements of different levels of ambition for the Security and Defence Union, in terms of solidarity, operations, capabilities, industry and use of financial resources. The scenarios illustrate the extent to which the EU's potential added-value can be unlocked depending on the appetite of Member States. Some of the elements mentioned in the scenarios are currently already examined or implemented. The three scenarios are illustrative in nature and do not prejudge the final legal and political position of the Commission. In this scenario, the EU27 Member States would cooperate on security and defence more frequently than in the past. Such cooperation would remain largely voluntary, and would depend on ad-hoc decisions as and when a new threat or crisis emerges. While an increasingly complex and unstable world would warrant greater cooperation than in previous decades, Member States would not be bound – politically or legally – by a common direction of travel in security and defence. Solidarity would be interpreted and expressed on a case-by-case basis by each Member State. The European Union would continue to be able to deploy civilian missions and relatively small-scale military missions and operations aimed at crisis management. It would mainly engage in capacity building missions to strengthen and reform the security and defence apparatuses of partner countries, reinforcing the EU’s own resilience in the process. Larger-scale and more complex operations would be spearheaded by the most capable Member States. In each case, the Union’s strategic margin of manoeuvre would depend on the level of agreement between Member States. The EU would complement the efforts of individual Member States and of our core partners. In particular, cooperation with NATO would continue to intensify in areas such as hybrid threats, cyber and maritime security, where effective responses require a combination of hard and soft power. However, where both the EU and NATO are present, NATO would continue to rely on the deeper military capabilities at its disposal, whereas the EU would exploit its broader toolbox and link up its “softer” tools, instruments and actions to its targeted military missions and operations. Responses to non-conventional threats that straddle the internal-external policy divide such as terrorism, hybrid or cyber, would remain largely national but would become more effective through greater support at EU level. The European Union would facilitate more information sharing to improve awareness and enhance the resilience of Member States. National security and intelligence services would exchange information more systematically to help better, and collectively, understand external threats. Member States would increase their exchange of information on cyber-threats and attacks, allowing them to develop more effective national strategies, capabilities and responses. The Union would also contribute directly to enhancing the resilience of critical infrastructures, supply chains, and societies, in areas such as energy and space. The European Border and Coast Guard would help monitor and protect the EU's external borders. Defence cooperation would remain a political goal. There would be more collective work, notably on the development of select critical technologies or on the logistical enablers of military operations. An increase in cooperation would be driven mostly bottom-up by the economic and technological drivers discussed above. It would also result from an effort to increase the transparency of Member States’ defence planning, the creation of an EU defence research programme and the establishment of the European Defence Fund to develop new capabilities together. These initiatives would promote Europe’s strategic autonomy in critical technologies and would mark an increase in the value for money of defence spending. However, Europe’s defence industry would remain fragmented. The bulk of defence capabilities, particularly complex platforms, would continue to be developed and procured on a national basis. The slight increase in defence spending by Member States would generally not be spent collaboratively. As a result, very few – if any – EU countries would retain full spectrum armed forces. EU security and defence actions would continue to rely on voluntary national contributions, leading to insufficient cooperation in critical areas such as high-end capabilities. This would limit the EU’s ability to engage in the most demanding missions. In this scenario, the EU27 Member States would move towards shared security and defence. They would show far greater financial and operational solidarity in the field of defence, building on a broader and deeper understanding of respective threat perceptions and convergence of strategic cultures. As a result, the EU would enhance its ability to project military power and to engage fully in external crisis management and in building partners’ security and defence capacities. It would also improve its ability to protect Europe in areas straddling the internal-external divide such as counterterrorism, countering of hybrid and cyber threats, border control and maritime and energy security. The EU’s cooperation with NATO would further increase. The EU and NATO would systematically cooperate and coordinate in mobilising the full range of their respective tools and instruments. Externally, the EU and NATO would enhance coordination of their crisis management and capacity building actions, for instance through coordinated surveillance operations, interventions against terrorist groups, or maritime security and border protection missions. At the point where internal and external security meets, the EU would take more decisive action in dealing with threats and challenges falling below the threshold of the collective defence clause of the Washington Treaty. On crisis management, the EU would significantly step-up its ability to project military force externally, enabling it to conduct high intensity operations in the fight against terrorism and hybrid threats. EU capacity building missions – civilian and military – would be scaled up, helping to make countries in surrounding regions and further afield more resilient. This would be facilitated by more effective and robust crisis management structures. It would also need a greater willingness from Member States with the strongest armed forces to execute demanding crisis management missions and operations together on behalf of the Union in line with Article 44 of the Treaty on European Union. Greater ability to act would be matched by the political will to do so. Decision-making would become quicker and would match the speed of the rapidly changing strategic context. The EU would ultimately become a stronger and more responsive security provider, with the strategic autonomy to act alone or alongside its core partners. In this scenario, the EU would be more directly engaged in the protection of Member States and citizens in case of significant attacks or disruptions against a country and/or its critical infrastructures. The EU would enable cooperation between Member States on systematic reporting on cyber-attacks. It would help increase resilience, step up cyber exercises and include a defence dimension to them. Stronger cooperation and effective prosecution would increase the ability to find and punish criminals, thus providing a stronger deterrent against cyber-attacks. Member States’ intelligence (threat analysis and assessments) would be systematically shared and merged, and the Union would maintain a strong focus on the fight against terrorist financing, organised crime and money laundering. A further strengthened European Border and Coast Guard, utilised to its maximum would monitor and protect the EU’s external borders, working in synergy with defence forces. The Union would also step up its work to diversify energy sources, develop and promote energy safety standards, coordinate preparedness for health threats, and improve customs risk management. Finally, the Union would further develop its space programmes, providing additional services for security and defence, including border and maritime surveillance, search and rescue functions, or secure government communication. The scope of the surveillance and tracking support framework could be extended to address cyber threats or other threats to satellites or ground infrastructures. On defence, cooperation between Member States would become the norm rather than the exception. National defence planning would become far more aligned, facilitating Member States’ cooperation on the acquisition and maintenance of capabilities, thus improving interoperability. Duplications between Member States would be drastically reduced. The development and procurement of complex platforms would be run cooperatively. Spearheaded by an ambitious European Defence Fund, Member States would develop multinational capabilities in several fields more systematically, including in strategic transport, remotely piloted aircraft systems, maritime surveillance and satellite communications, as well as offensive capabilities. These multinational capabilities would be supported by joint planning and command structures at EU-level, as well as logistics. Specifically, standby multinational force components as well as a medical and an EU-wide air transport command would provide effective support to EU missions and operations, while a shared European military culture would be fostered through joint education, training and large-scale exercises. In addition, critical technologies would be developed through European programmes, notably in the field of artificial intelligence, bio-technology and supercomputing. 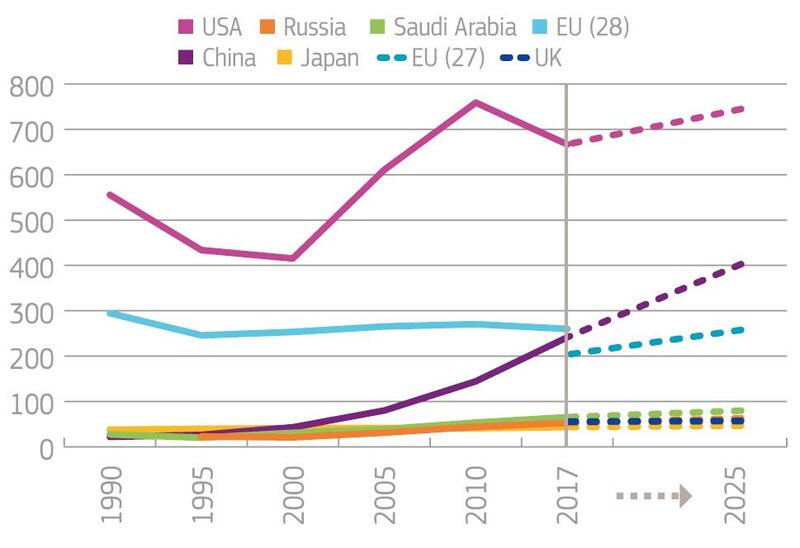 A European observatory could be set up to screen foreign direct investment in these critical technologies and analyse their potential impact. Europeans would become more capable through interoperable land, air, space and maritime defence capabilities. Furthermore, there would be a more rational use of resources thanks to the economies of scale reaped by a consolidated defence industry operating in an EU-wide defence equipment market and favourable financing conditions across the supply chain towards small and medium-sized enterprises. In this scenario, Member States would deepen cooperation and integration further towards a common defence and security. Such a Security and Defence Union would be premised on the global strategic, economic and technological drivers, as well as a political push from European citizens for common European security and defence. Solidarity and mutual assistance between Member States in security and defence would become the norm, building on the full exploitation of Article 42 of the Treaty on European Union which includes the progressive framing of a common Union defence policy, leading to common defence. In full respect of the obligations of Member States which see their common defence realised in the North Atlantic Treaty organisation, the protection of Europe would become a mutually reinforcing responsibility of the EU and NATO. Complementing NATO, Europe's Common Security and Defence would enhance Europe's resilience and protect against different forms of aggression against the Union, as well as provide reassurance that our citizens expect. The EU would be able to run high-end operations to better protect Europe, potentially including operations against terrorist groups, naval operations in hostile environments or cyber-defence actions. Security threats would be systematically monitored and assessed jointly, in close cooperation with national security and intelligence services. Contingency planning would be carried out at European level, bringing internal and external security closer together. The interconnection of national security interests would lead to genuine European security interests. The increased ability to act at EU level would be underpinned by a greater level of integration of Member States’ defence forces, further strengthening solidarity among Member States. Such forces would be pre-positioned and be made permanently available for rapid deployment on behalf of the Union. They would engage in regular joint military exercises, and receive regular training in European Defence Colleges to facilitate the convergence of strategic cultures. Internally, the EU would enhance its resilience and that of its Member States through sectoral policies in areas such as cybersecurity, the protection of critical infrastructure, or countering violent extremism. On cyber-security, the EU would coordinate response scenarios and action in case of cyber-attacks or external interference in Member States' democratic processes, including through systematic information sharing, technological cooperation and joint doctrines. The European Border and Coast Guard would rely on standing European maritime forces and on European intelligence assets such as remotely piloted aircraft systems or satellites. A European civil protection force would be established to rapidly react to natural or man-made disasters. Fixed arrangements among Member States would allow rapid movement of military equipment across Europe. Member States’ defence planning would become fully synchronised, and national priorities for capability development would account for agreed European priorities. Such capabilities would be subsequently developed on the basis of close cooperation, even integration or specialisation. Capabilities in areas such as space, air and maritime surveillance, communication, strategic airlift and cyber would be commonly procured by Member States with the support of the European Defence Fund to ensure immediate responses. Europe would be able to deploy detection and offensive cyber-capabilities. Collaborative multinational development and procurement programmes would be scaled up significantly in areas like transport aircraft, helicopters, reconnaissance assets or CBRN defence capabilities. All this would be underpinned by a genuine European defence market, with a European mechanism to monitor and protect key strategic activities from hostile external takeovers. A dedicated European Defence Research Agency would support forward-looking defence innovation and help translate it into the military capabilities of tomorrow. Cutting edge knowledge would be pooled, enabling critical research and start-ups to develop key technologies to address Europe’s security challenges. Efficient defence spending and more and better defence outputs would be achieved through the right mix of competition and consolidation, specialisation, economies of scale, the sharing of expensive military assets and technological innovation aimed at getting the best value for money spent. The EU complements Member State efforts, solidarity remains ad hoc and interpreted individually by Member States. Capacity-building missions, small crisis management operations, greater exchange of intel, EU support to Member State resilience. EU-NATO cooperation continues as it is now. Developing select key technologies at EU level, but difficulties in retaining full spectrum capabilities; limited use of the European Defence Fund. EU supplements Member State efforts, operational and financial solidarity between Member States becomes the norm. Crisis management, capacity-building &protection at internal-external nexus. Member States monitor/assist each other on cyber & share intel, European Border and Coast guards protect external borders. 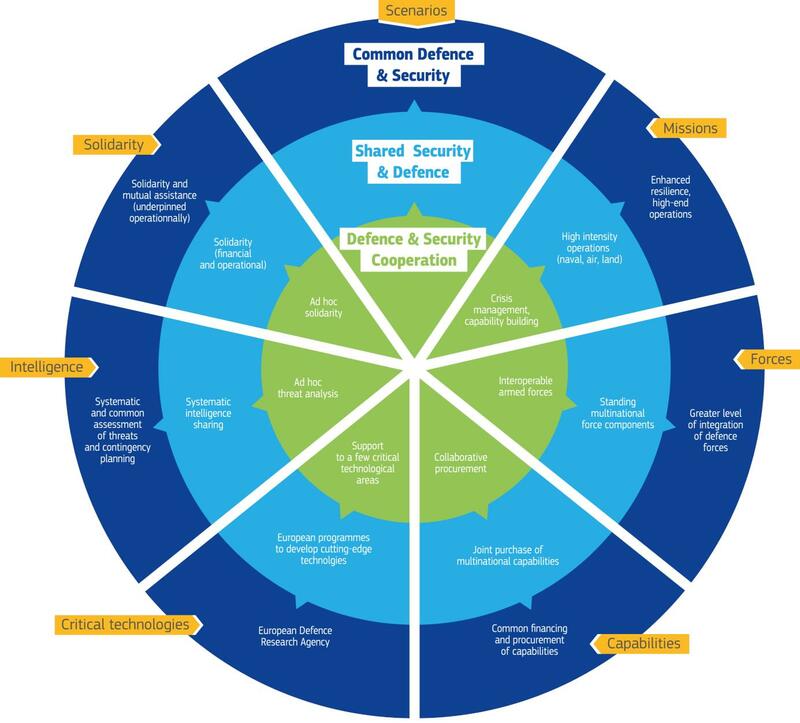 EU-NATO coordinate on full spectrum of hard/soft security areas. Common planning and development of value chains. 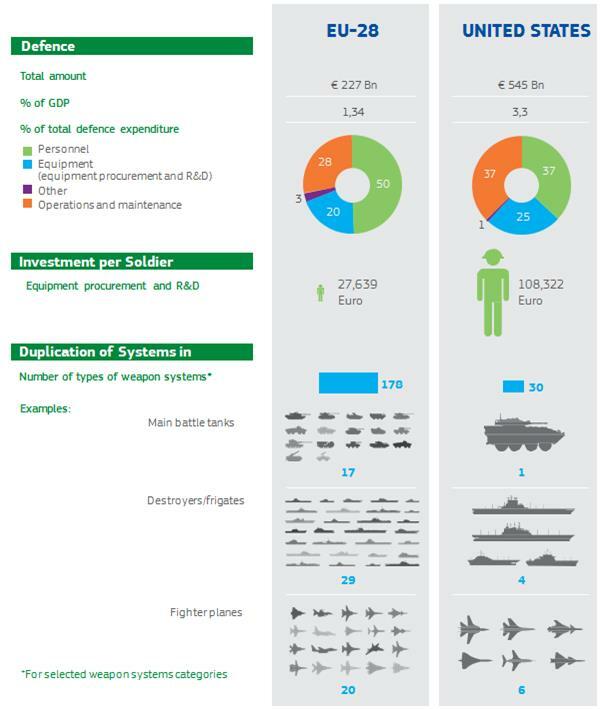 Considerable economies of scale in defence market at European scale, favourable financing conditions across the defence supply chain. Solidarity and mutual assistance, common defence as foreseen by the Treaty. Demanding executive EU-led operations; joint monitoring/assessment of threats and contingency planning. EU level cyber security; European Border and Coast Guards rely on standing maritime forces and European intelligence assets such as drones/satellites; European civil protection force. Complementing NATO, Europe's Common Security and Defence would enhance Europe's resilience and protect against different forms of aggression against the Union. Common financing and procurement of capabilities supported by the EU budget. Technological independence. Efficient defence spending through more economies of scale, specialisation, sharing of expensive military assets and technological innovation aimed at reducing defence costs, and becoming better equipped to face international competition. Enhancing European security is a must. Member States will be in the driving seat. They will define and implement the European level of ambition, with the support of EU institutions. The initiatives currently underway indicate clearly that Member States and EU institutions have already embarked upon this road. But how quick do Member States want to build a genuine European Security and Defence Union? To which extent are they willing to anticipate rather than to react to the strategic context? How far do they consider that the European security is a European responsibility? Old caveats are known and need to be overcome. The future of the European Union as a peace project for generations to come now rests also on the foundation of a Security and Defence Union: looking at 2025, Member States will decide the path and speed they want to go to protect our citizens. 1. The common security and defence policy shall be an integral part of the common foreign and security policy. It shall provide the Union with an operational capacity drawing on civilian and military assets. The Union may use them on missions outside the Union for peace-keeping, conflict prevention and strengthening international security in accordance with the principles of the United Nations Charter. The performance of these tasks shall be undertaken using capabilities provided by the Member States. The policy of the Union in accordance with this Section shall not prejudice the specific character of the security and defence policy of certain Member States and shall respect the obligations of certain Member States, which see their common defence realised in the North Atlantic Treaty Organisation (NATO), under the North Atlantic Treaty and be compatible with the common security and defence policy established within that framework. 3. Member States shall make civilian and military capabilities available to the Union for the implementation of the common security and defence policy, to contribute to the objectives defined by the Council. Those Member States which together establish multinational forces may also make them available to the common security and defence policy. Member States shall undertake progressively to improve their military capabilities. The Agency in the field of defence capabilities development, research, acquisition and armaments (hereinafter referred to as "the European Defence Agency") shall identify operational requirements, shall promote measures to satisfy those requirements, shall contribute to identifying and, where appropriate, implementing any measure needed to strengthen the industrial and technological base of the defence sector, shall participate in defining a European capabilities and armaments policy, and shall assist the Council in evaluating the improvement of military capabilities. 4. Decisions relating to the common security and defence policy, including those initiating a mission as referred to in this Article, shall be adopted by the Council acting unanimously on a proposal from the High Representative of the Union for Foreign Affairs and Security Policy or an initiative from a Member State. The High Representative may propose the use of both national resources and Union instruments, together with the Commission where appropriate. 5. The Council may entrust the execution of a task, within the Union framework, to a group of Member States in order to protect the Union's values and serve its interests. The execution of such a task shall be governed by Article 44. 6. Those Member States whose military capabilities fulfil higher criteria and which have made more binding commitments to one another in this area with a view to the most demanding missions shall establish permanent structured cooperation within the Union framework. Such cooperation shall be governed by Article 46. It shall not affect the provisions of Article 43. 7. If a Member State is the victim of armed aggression on its territory, the other Member States shall have towards it an obligation of aid and assistance by all the means in their power, in accordance with Article 51 of the United Nations Charter. This shall not prejudice the specific character of the security and defence policy of certain Member States. 1. Within the framework of the decisions adopted in accordance with Article 43, the Council may entrust the implementation of a task to a group of Member States which are willing and have the necessary capability for such a task. Those Member States, in association with the High Representative of the Union for Foreign Affairs and Security Policy, shall agree among themselves on the management of the task. 2. Member States participating in the task shall keep the Council regularly informed of its progress on their own initiative or at the request of another Member State. Those States shall inform the Council immediately should the completion of the task entail major consequences or require amendment of the objective, scope and conditions determined for the task in the decisions referred to in paragraph 1. In such cases, the Council shall adopt the necessary decisions. (e) contribute to identifying and, if necessary, implementing any useful measure for strengthening the industrial and technological base of the defence sector and for improving the effectiveness of military expenditure. 2. The European Defence Agency shall be open to all Member States wishing to be part of it. The Council, acting by a qualified majority, shall adopt a decision defining the Agency's statute, seat and operational rules. That decision should take account of the level of effective participation in the Agency's activities. Specific groups shall be set up within the Agency bringing together Member States engaged in joint projects. The Agency shall carry out its tasks in liaison with the Commission where necessary. 1. Those Member States which wish to participate in the permanent structured cooperation referred to in Article 42(6), which fulfil the criteria and have made the commitments on military capabilities set out in the Protocol on permanent structured cooperation, shall notify their intention to the Council and to the High Representative of the Union for Foreign Affairs and Security Policy. 2. Within three months following the notification referred to in paragraph 1 the Council shall adopt a decision establishing permanent structured cooperation and determining the list of participating Member States. The Council shall act by a qualified majority after consulting the High Representative. A qualified majority shall be defined in accordance with Article 238(3)(a) of the Treaty on the Functioning of the European Union. 4. If a participating Member State no longer fulfils the criteria or is no longer able to meet the commitments referred to in Articles 1 and 2 of the Protocol on permanent structured cooperation, the Council may adopt a decision suspending the participation of the Member State concerned. The Council shall act by a qualified majority. Only members of the Council representing the participating Member States, with the exception of the Member State in question, shall take part in the vote. 5. Any participating Member State which wishes to withdraw from permanent structured cooperation shall notify its intention to the Council, which shall take note that the Member State in question has ceased to participate. 6. The decisions and recommendations of the Council within the framework of permanent structured cooperation, other than those provided for in paragraphs 2 to 5, shall be adopted by unanimity. For the purposes of this paragraph, unanimity shall be constituted by the votes of the representatives of the participating Member States only.